The vision for Arden Park was to create a residential address that was accessible to, and embraced by, a wide variety of Melbournians. Lying on the CBD’s north-western edge, North Melbourne has a highly desirable school zone, fantastic public transport options and is close to the famous Queen Victoria Markets. Designed completely inhouse by PDG’s architects and designers, the design brief was to meet the diverse range of lifestyle requirements through space, light, amenity and livability. 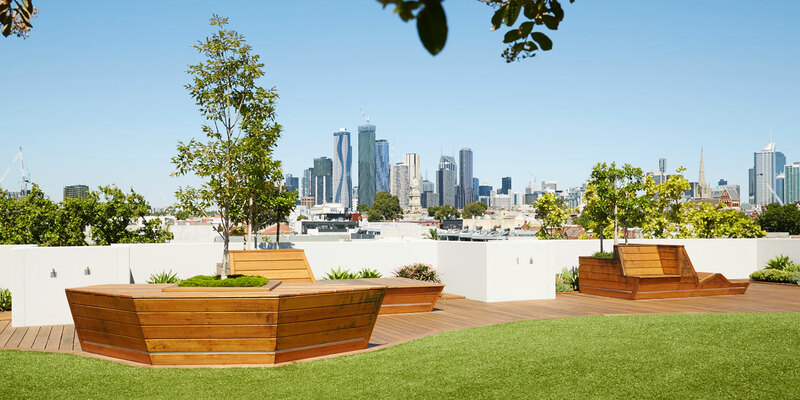 Underpinning the development’s appeal is a roof top park with barbecues, green rolling hills, veggie plots and timber sun lounges. Over the last month we have been thrilled to hand over all 79 completed apartments to their new owners. And the new residents of Arden Park truly are a diverse group; from first home buyers, young professional couples and families to downsizers and retirees. The views of the city skyline from the roof top park are even better than expected and we have no doubt that many a wonderful celebration will be had in this space. While the vast majority of apartments are owner occupier, there are a limited number which have been purchased as an investment by some of our VIP clients. For enquiries on any available properties for rent, please contact Melcorp Real Estate on +61 3 9663 1117.